MR Direct is your one stop shop for all of your sink and faucet needs. 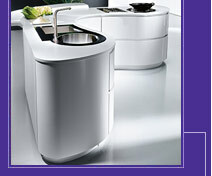 MR Direct has been known for years to offer great quality sinks at extremely low prices. MR Direct International is located in Toledo, Ohio. MR Direct supplies and distributes their own "MR Direct" brand sinks and faucets. Since MR Direct is direct there is no "middle man" to mark up prices. MR Direct offers the best quality faucets, undermount stainless steel sinks, porcelain sinks, granite sinks, and glass sinks. They offer items for both kitchens and bathrooms ranging from modern to traditional styling to match any décor. MR Direct proudly stand behind all of our products with a Limited Lifetime Warranty. MR DIRECT 90 Degree Sinks are made from solid 16 gauge and 10’’ deep. This line provides the largest sink depth and stainless look to accommodate today’s modern kitchen. They also come with SoundGuard undercoating as well as thick sound dampening pads. All sinks supplied with cutout template and fasteners. MR Direct 2321S Stainless Steel Undermount 90 Degree Single Bowl. Overall Size: 19'' x 20'', 10'' Deep. Undercounter installation. StoneGuard Undercoated over rubber pad. Offset drain, 3-1/2'' drain opening. Brushed Satin Finish. 18 Gauge Stainless Steel. Supplied With Cutout Template, Fasteners. Lifetime Warranty. Required Drain Strainer 114 S/S Sold Separately. MR Direct 3322S Stainless Steel Undermount 90 Degree Single Bowl Kitchen Sink. Overall Size: 32'' x 19'', 10'' Deep. 16 Gauge Gauge Steel. StoneGuard Undercoated over rubber pad. Offset drain, 3-1/2'' drain opening. Brushed Satin Finish. Supplied with cutout template, fasteners. Lifetime Warranty. Required Drain Strainers 114 S/S Sold Separately. MR Direct 3322D Stainless Steel Undermount 90 Degree Double Bowl Kitchen Sink. Overall Size: 32'' x 19'', 10'' Deep. Both bowls are the same size: 17'' x 14 1/2''. 16 Gauge Gauge Steel. StoneGuard Undercoated over rubber pad. Offset drain, 3-1/2'' drain opening. Brushed Satin Finish. Supplied with cutout template, fasteners. Lifetime Warranty. Required Drain Strainers 114 S/S Sold Separately. MR Direct 3322OL Stainless Steel Undermount 90 Degree Double Bowl Kitchen Sink. Overall Size: 32'' x 19'', 10'' Deep. Small bowl on the right. Each bowl: 17'' x 16'', 17'' x 13''. 16 Gauge Gauge Steel. StoneGuard Undercoated over rubber pad. Offset drain, 3-1/2'' drain opening. Brushed Satin Finish. Supplied with cutout template, fasteners. Lifetime Warranty. Required Drain Strainers 114 S/S Sold Separately. MR Direct 3322OR Stainless Steel Undermount 90 Degree Double Bowl Kitchen Sink. Overall Size: 32'' x 19'', 10'' Deep. Small bowl on the left. Each bowl: 17'' x 13'', 17'' x 16''. 16 Gauge Gauge Steel. StoneGuard Undercoated over rubber pad. Offset drain, 3-1/2'' drain opening. Brushed Satin Finish. Supplied with cutout template, fasteners. Lifetime Warranty. Required Drain Strainers 114 S/S Sold Separately. MR Direct 114 S/S Sink Strainer. Fits 3-1/2'' (114 mm) Drain. Drain Assembly Designed To Fit MR Direct Sinks.